Sacred Listening is a transpersonal counseling practice that is present centered and considers the physical, emotional, mental, and spiritual aspects of each individual. In the space of Sacred Listening, you no longer have to stay stuck in the past or future, where you are powerless. Instead, you can receive help in connecting to the present, where answers, miracles, and power preside. As you move past the old instincts of fear and flight, you come into a place of knowing, of truth and love. You become aware of your ability to choose happiness, peace, love, joy, and freedom in every moment. About HarDarshan: HarDarshan is a champion of the Individual – of being true to oneself and honoring one’s unique gifts and needs. She has a special interest in working with HSP’s – highly sensitive persons – who must assert for themselves and others deeper perceptions than is the norm, and whose very attention to self care goes against the grain of the tribe or collective. She knows well that when one honors oneself and meets life as an unique individual, the change occurs that has inherent value not just for oneself but also for others. HarDarshan is a model of individuality and creativity. Her favorite therapeutic tool is sand tray play, which engages the unconscious to express healing stories about one’s inner and outer life. She has turned her home into an ashram named Mata Shakti, dedicated to the feminine principle of love and regeneration. 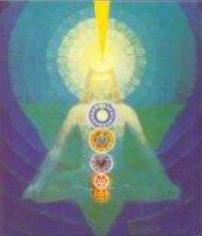 Her mission is to serve the higher self and creative life force, and to inspire the same in others. 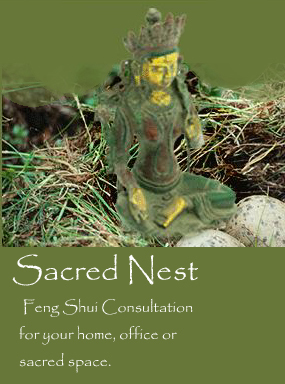 Her special blend of creativity can also be seen in her gardening and kundalini yoga classes. In all her creative endeavors – yoga, gardening, cooking, singing, sustaining the ashram, and her practice as a psychotherapist – she engages spiritual forces for the sake of love, healing, beauty, and the highest ideals. 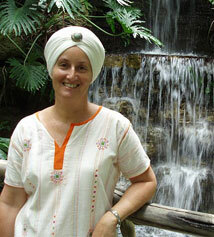 HarDarshan’s style is warm, gentle, sincere – and despite her wearing a turban – unassuming. She is a role model of a life lived true to one’s inner most self. That is what she inspires in others. Her clients’ results include a more integrated sense of self, a great sense of balance, calmer emotions, and an increased sense of purpose in life. I have been a hospital chaplain since 2002 and have taught yoga and meditation since 1985.I have respect for diverse faith traditions, having worked with people from all walks of life. I will co-create with you the tools that will help you to be fulfilled within yourself and in your relationships. My goal is always to LISTEN to YOU. Our focus will be PRESENT CENTERED & POSITIVE! Besides traditional talk therapy, HarDarshan holds a certificate in Sandtray Therapy , is a certified instructor and Lead Teacher Trainer for Kundalini Yoga and Meditation, and enjoys using adjuct tools such as aromatherapy, numerology, flower remedies and western Feng Shui. Please enjoy listening to the Adi Mantra sung by Sat Shabd Singh of Chile, and available on the CD “Guru” available from www.spiritvoyage.com.